For many years, I always referred to sorbet as “sore-bet” rather than the correct pronunciation “sore-bay.” My dad called it “sore-bet,” my mom called it “sore-bet,” so naturally I thought it was “sore-bet.” Who was I, an innocent and easily corrupted little child, to know the difference? Sadly, “sorbet” is not the only word I’ve pronounced incorrectly for years, only to find out that I’ve been sounding like an idiot for way too long. Like when I used to talk about “ether-real” desserts (ethereal), “super-flouse” amounts of something (superfluous), and what to order for “horse-da-vores” (hors d’oeuvres). Classy. 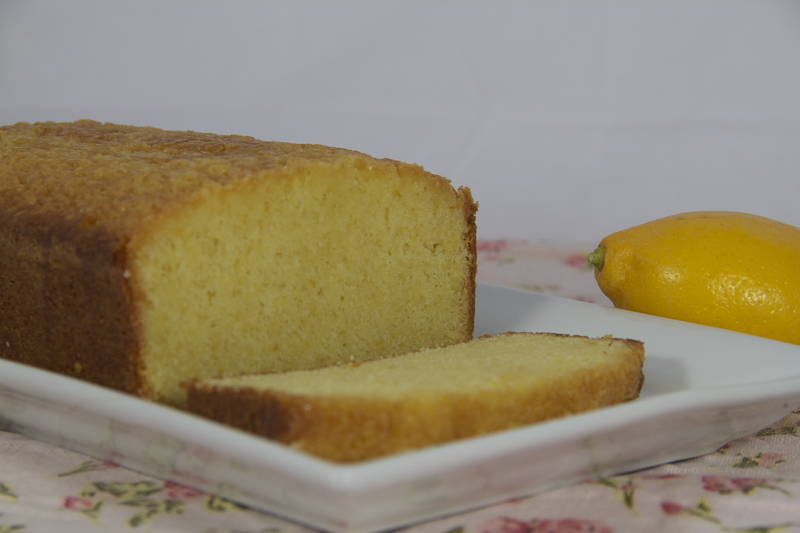 Now that we’ve gotten the pronunciation issue squared away nicely, I can present to you this fabulous recipe for Lemon SorbAY! 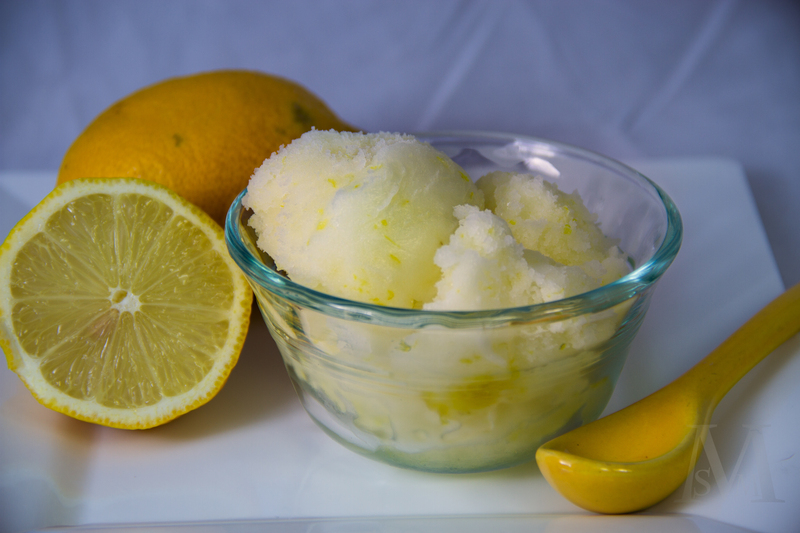 Its tart, sweet, zesty, icy lemon freshness is the perfect refresher to end any summer meal. Or winter meal. Or fall meal or spring meal for that matter. With only FOUR ingredients (two of them coming from the same fruit and one of them being water) this is one of the simplest recipes out there. 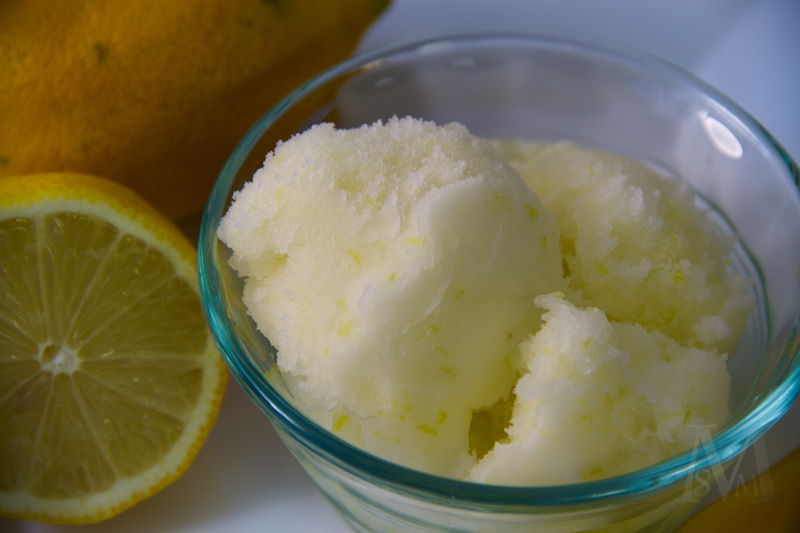 Just heat up a simple syrup of water and sugar, let it cool while squeezing and zesting some fresh, juicy lemons, stir it all together, pour it into an ice cream maker, freeze for a couple hours if desired, and voila! 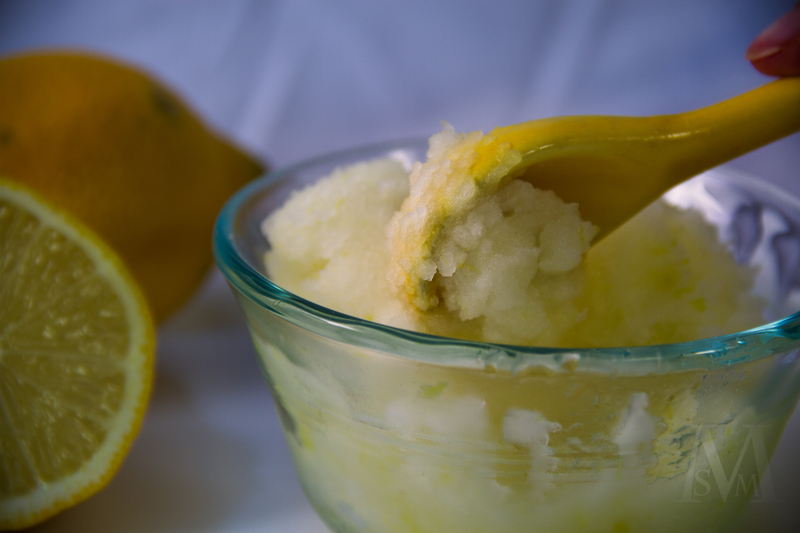 Fresh, homemade sorbet ready to be gobbled up at your earliest convenience. Combine the water and sugar in a small saucepan. Place over medium heat, stirring occasionally, until the mixture comes to a boil. Reduce heat to low and simmer for 2 minutes, uncovered. Pour the mixture (called a simple syrup) into a bowl and cool completely. When the syrup is cool, stir in the lemon juice and lemon zest. Pour the mixture into an ice-cream maker and freeze according to maker’s instructions. (Mine takes about 25-30 minutes.) 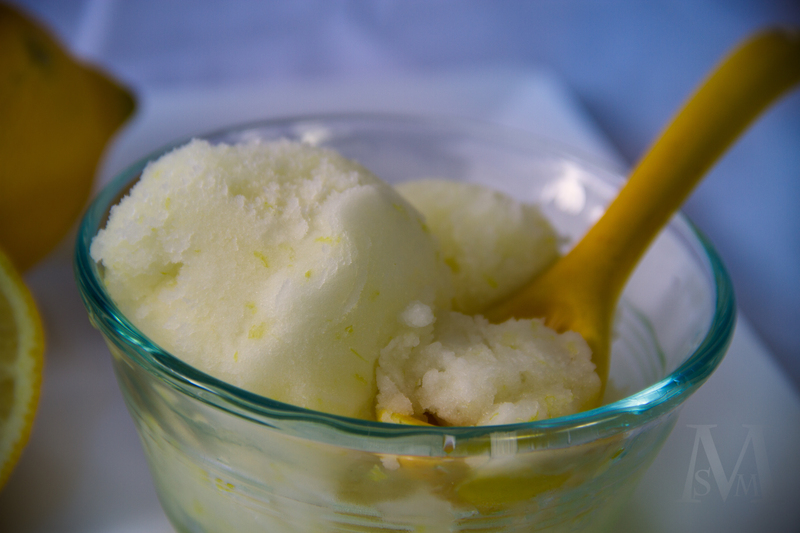 Sorbet will be soft and slushy. 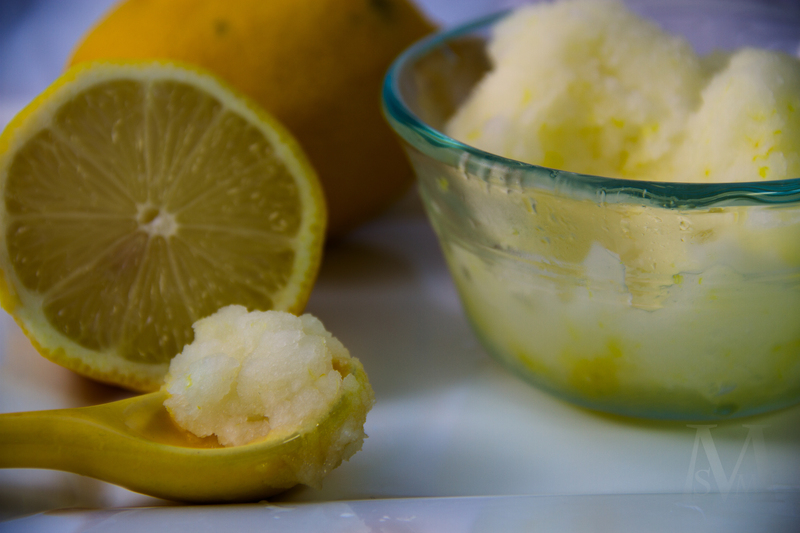 Serve the sorbet immediately or transfer it to a container and freeze for 4 hours or until firm. Makes about 2 cups. One of my favorite things about summer is the fruit. As fresh strawberries, raspberries, blueberries, peaches, plums, mangoes, cherries, and more start appearing in the produce section I feel much like a kid in a candy store. Since on our tiny island it’s ridiculously expensive (and often impossible) to attain summery fruits throughout most of the year, I always look forward to loading up on all my favorite fruits throughout the spring and summer months. 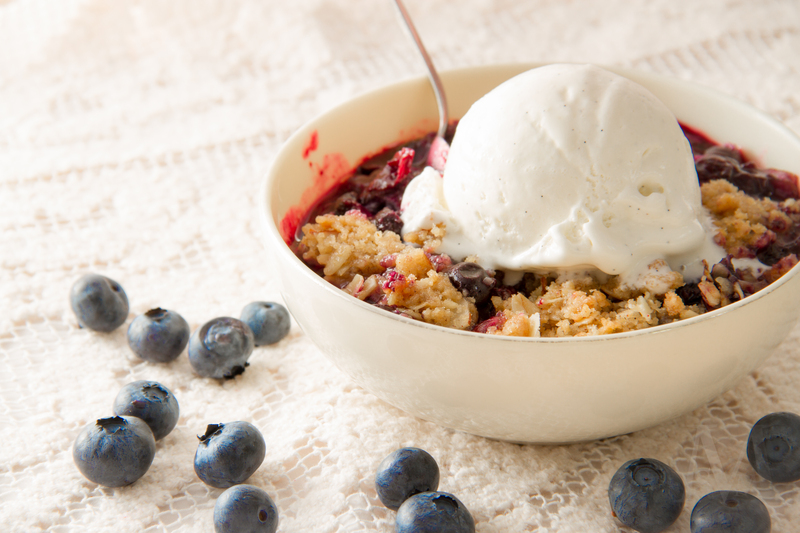 Summertime’s surplus of fresh fruit also means some extra-tasty desserts. As convenient as frozen fruit is, there’s nothing like a blackberry pie made with berries picked from the wild tangle of bushes down the lane or a rustic galette filled with sweet, fresh cherries rather than the usual sticky red canned ones. Pies, cobblers, crumbles, etc. are some of my favorite go-to desserts throughout the summer because they allow for sweet, juicy fruits to take center stage. 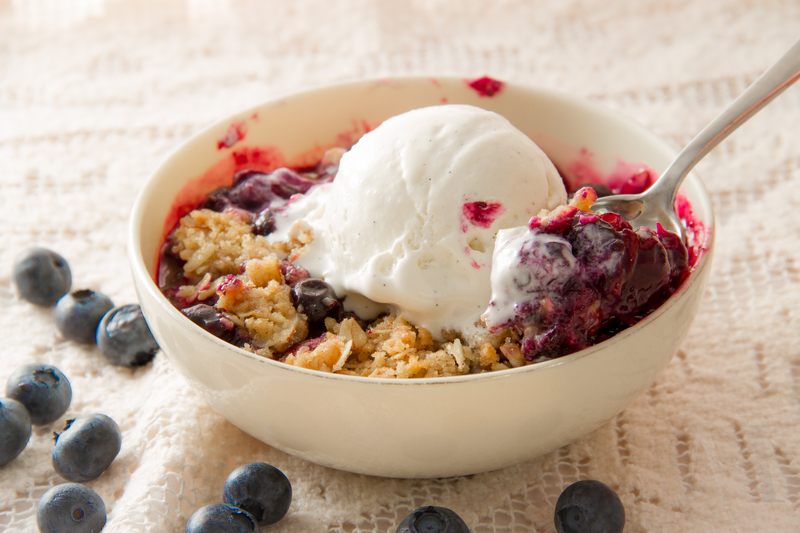 This Blueberry-Almond Crisp is the perfect treat for a warm summer evening: plump, sweet blueberries are tucked underneath an oatmeal-almond crumble topping and baked until the top is crisp and golden and the berries are thick and bubbly. 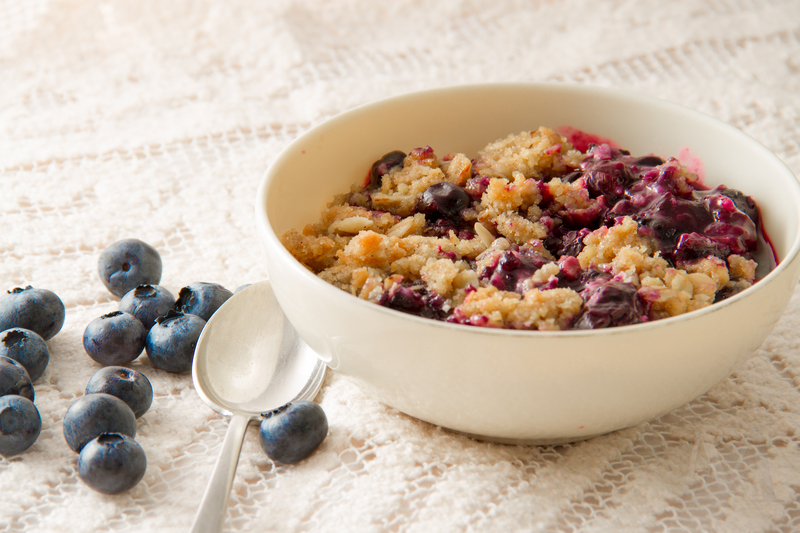 I love the combination of blueberries and almond, and this crumb topping packs in just the right amount of almond crunch and flavor to contrast the sweet, juicy blueberries. 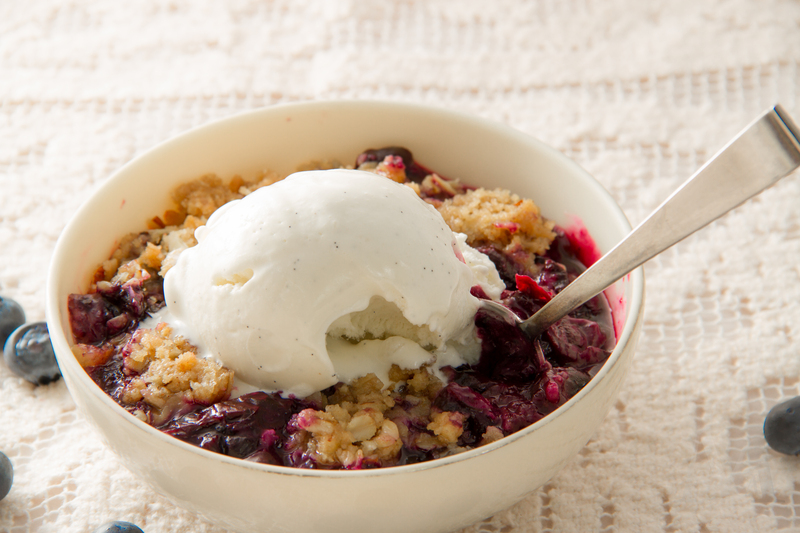 A warm bowl of Blueberry-Almond Crisp with a scoop of vanilla ice cream tastes like the epitome of summer, at least in my book. This recipe has become a summertime favorite in my family. 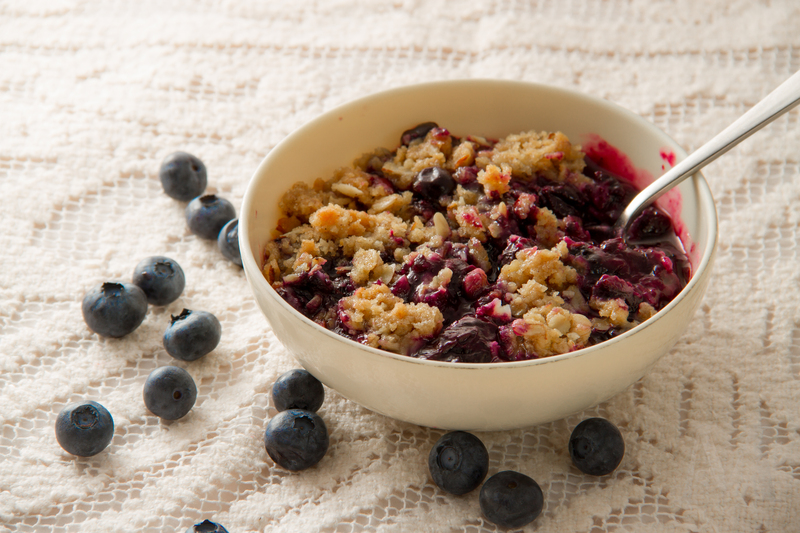 Go pick up a container of fresh blueberries and try out this wonderful crisp for yourself! You don’t want to miss out on this one. Preheat oven to 350 degrees F. Lightly grease an 8″x8″ baking pan; set aside. Place the blueberries in a large bowl. Add in the lemon juice, lemon zest, vanilla, sugar, and flour. Gently fold the mixture until the blueberries are well-coated. Let the berries sit and macerate while you make the topping. For the topping, whisk together the flour, oats, almonds, sugars, salt, and cinnamon in a medium-sized bowl. Using two forks or your fingers, cut in the cold butter and almond paste until the mixture holds together into large crumbs. Spoon the berry mixture into the bottom of the prepared baking dish. Top with the crumb mixture and bake for 40-45 minutes or until the topping is golden-brown and the filling is bubbly. Let the crisp cool slightly. Serve warm or at room temperature with ice cream or whipped cream, if desired. Happy July 5th, everyone! I hope you all had a fun and safe 4th of July yesterday, whether your day was filled with sunshine, parades, picnics, friends, fireworks, or all of the above. Before heading downtown for our annual parade yesterday, I decided to start the morning off with a sweet treat to celebrate. 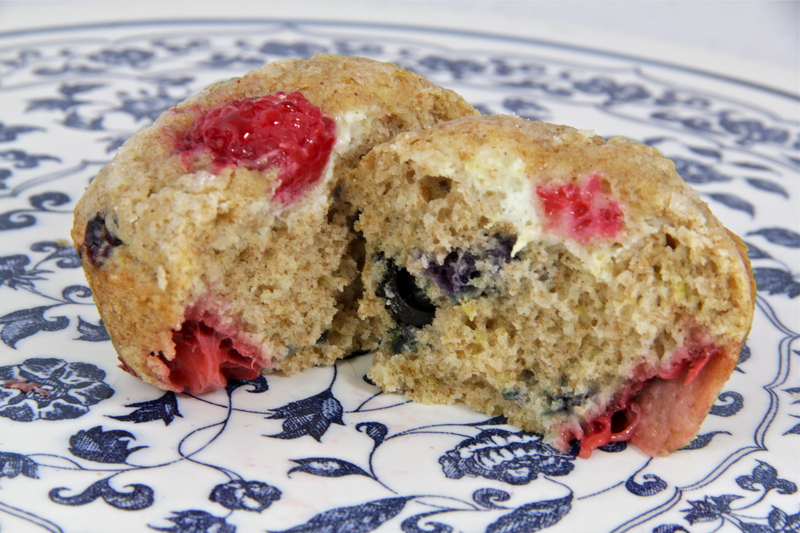 Lemon-Berry Muffins with Cream Cheese Filling fit the bill nicely: tender, sweet, lemony muffins bursting with fresh juicy berries and containing a surprise pocket of lemon-cream cheese filling. To make the muffins more festive I loaded them with a mixture of blueberries, strawberries, and raspberries and figured that the cream cheese filling qualified as the “white” part of my red-white-and-blue color scheme. Sure, the cream cheese was hidden in the center, so the color scheme was more like red-blue-and-muffiny brown, but who’s complaining? For all intents and purposes, they were red-white-and-blue. Okay? Okay. 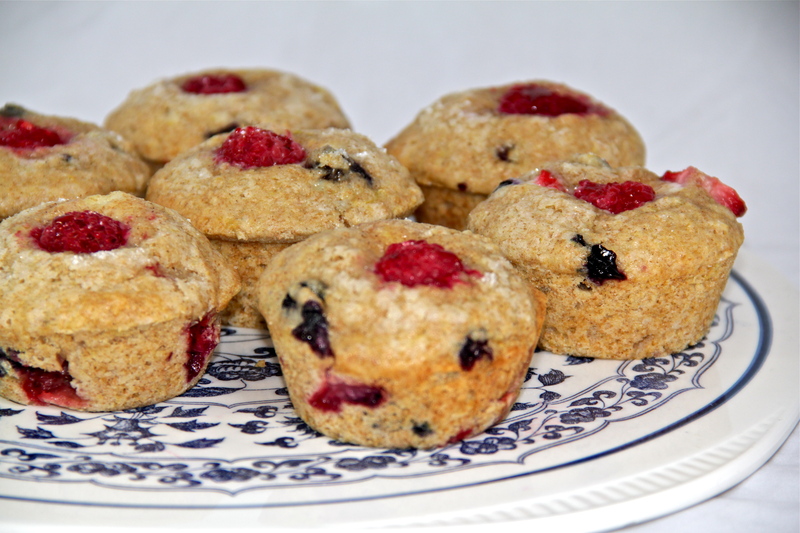 Although the muffins themselves are delicious with a soft, moist crumb; a hint of cinnamon, vanilla, and almond flavors; a fresh citrus zing from the lemon; and a triad of sweet, juicy berries, they’re made even better with the secret filling. One bite in and you’ll encounter a tiny pocket of sweet lemony cream cheese that takes these muffins from good to great! In my muffins I chose to use half whole-wheat flour and half all-purpose to give them a little more heft and fiber. The recipe below calls for only all-purpose flour, but it’s up to you. Same goes for the type of berries, extracts, spices, etc. Like many of my recipes, this one is highly adaptable! 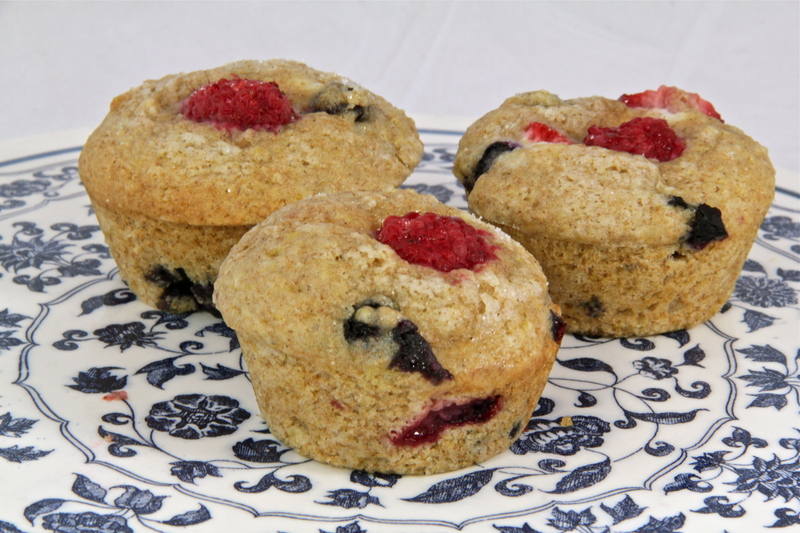 Bake up a batch of these Lemon-Berry Muffins as a special treat one of these mornings! In no time at all you can be enjoying a warm, fresh-out-of-the-oven muffin for breakfast or brunch. Be sure to watch for people’s reactions as they discover the sweet surprise filling. Some surprises are not so good (like the surprise that would have occurred had I not realized in the nick of time that I was starting to pour peppermint extract into my measuring spoon rather than vanilla) but this surprise is definitely a nice one! Unless of course you happen to dislike sweet lemony cream cheese stuffed inside a tender lemon-berry muffin. But that would be just plain silly. Preheat oven to 400 degrees F. Line or grease 9 cups of a 12-cup muffin tin; set aside. In a medium bowl, whisk together the flour, baking powder, salt, and cinnamon. 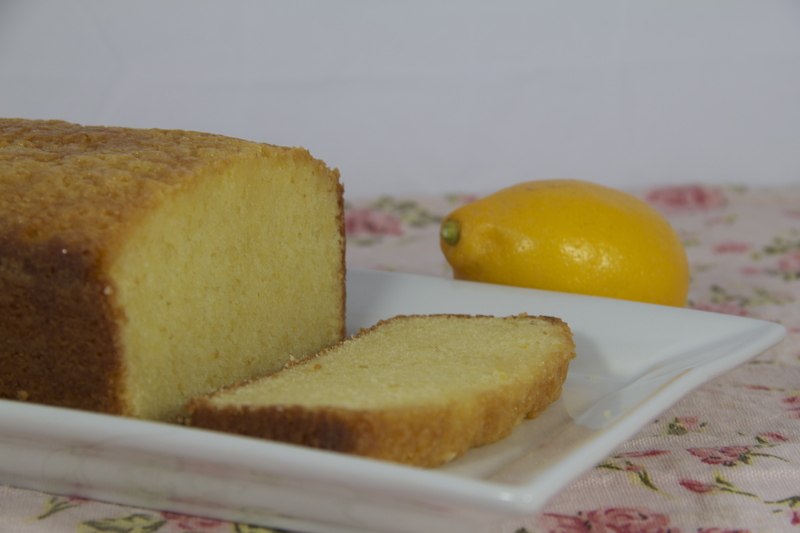 In a smaller bowl, use your fingers to incorporate the lemon zest into the sugar until fragrant. Whisk the lemon-sugar into the flour mixture. In another bowl, whisk together the milk, oil, egg, vanilla, and almond extract until smooth. Using a rubber spatula, fold the dry ingredients into the wet ingredients just until incorporated. Be careful not to over-mix. Gently fold the berries into the batter, which will be thick. To make the cream cheese filling, stir together the cream cheese, lemon zest, and sugar in a small bowl until smooth. Bake for 17-20 minutes or until tops are set and edges are golden-brown. Let the muffins cool in the pan for 10 minutes, then remove to a cooling rack. Years ago, before I was a bona fide baker (although whether I am even now depends on your definition 🙂 ), I often used baking mixes. Felt like it was a perfect morning for muffin-making? I would pull out a trusty Krusteaz box. Had a hankering for brownies? Pillsbury it was (the type with the chocolate syrup pouch, of course.) Cupcakes needed for a bake sale? Hello, Betty Crocker. The fall-back line seems to be that pre-packaged mixes are faster and easier than from-scratch recipes, but in all honesty you really don’t save that much time using mixes. Unless the project at hand is something like homemade cinnamon rolls or a particularly tricky candy, it’s almost as quick to mix up a batch of homemade brownies or cookies than to succumb to a chemical-laden, artificially-flavored box mix. In my humble opinion, baking from scratch is often cheaper, yields a better-textured and better-tasting product, and allows for much more variety in your baking. Well there’s my two cents! Now we can get down to business :). 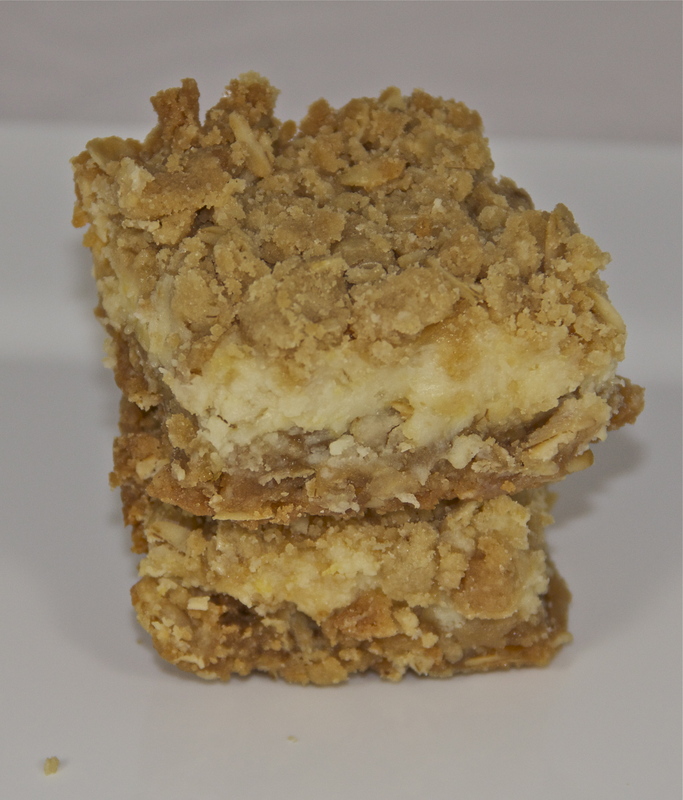 I originally found this recipe for Oatmeal Lemon Creme bars off the Betty Crocker website. The combination of crumbly oatmeal cookie and creamy lemon filling sounded utterly amazing, and I just knew I had to try them. However, the recipe called for a pouch of Betty Crocker oatmeal cookie mix, an ingredient which: a) would force me to eat my words about the evils of pre-packaged mixes and b) is unavailable at my two tiny grocery stores. They’ve got chocolate chip cookie mix, peanut butter cookie mix, sugar cookie mix, and molasses cookie mix, but no oatmeal cookie mix. Go figure! Not that I actually looked, of course, because that would mean that I was actually considering buying a mix. Which would be ludicrous, right? Um, right. 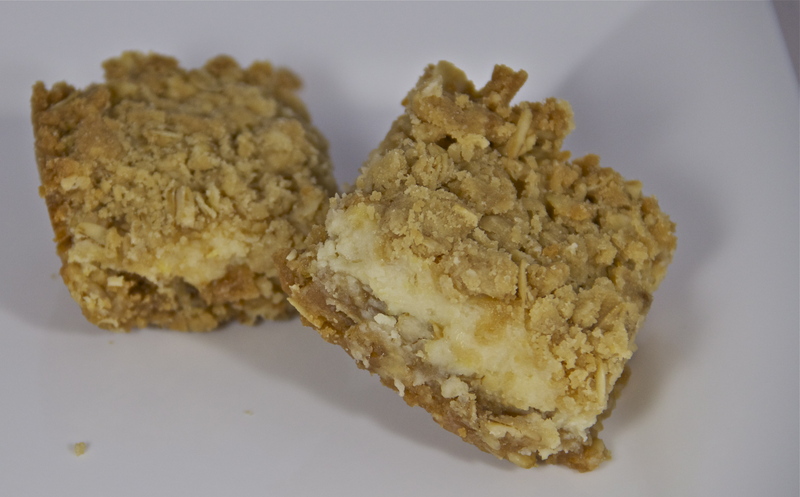 Lucky for me, a quick google of “Oatmeal Lemon Creme Bars” brought up a whole list of sites that had adapted the same Betty Crocker recipe, many of which included a from-scratch option for the cookie dough. Yay, internet! 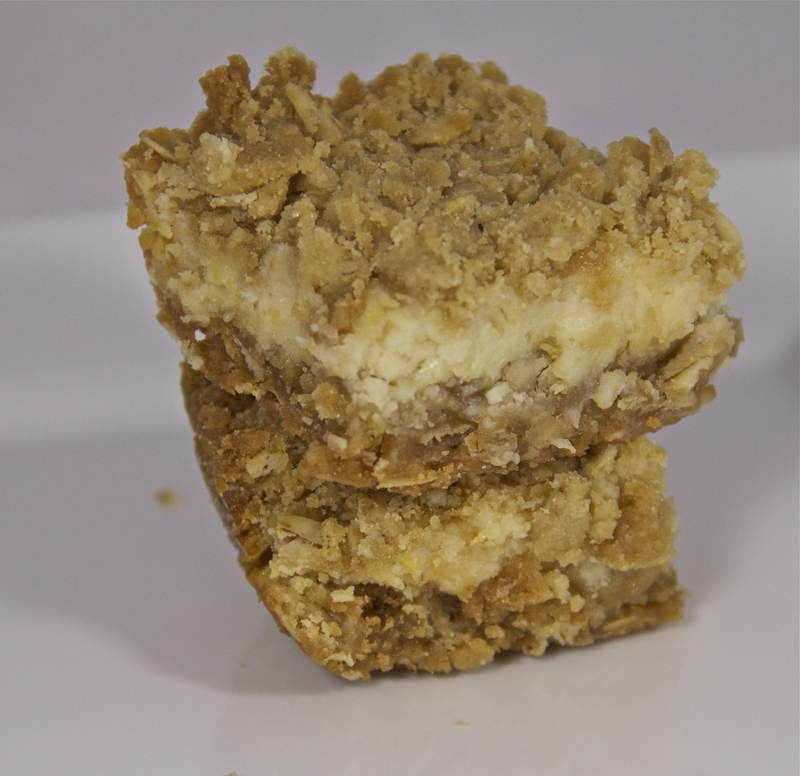 Happy that I could still try those glorious Oatmeal Lemon Creme Bars, I whipped them up in no time at all. For such a simple recipe, these sure take the cake (or should I say bar)! Their slightly crumbly, slightly crisp, not-too-sweet oatmeal top and bottom sandwich a smooth, creamy, lemony filling for a killer flavor (and texture) combination. The lemon flavor is definitely present but isn’t overpowering thanks to the thick, cheesecake-like filling and oatmeal cookie layers. Soooo good. I have to say the bars are best after being chilled, so that the filling can firm up a little and the crust gets nice and chewy, but they are delicious at room temperature as well. You really can’t go wrong! These are a perfect low-maintenance yet stellar dessert to bring to potlucks, parties, meetings, etc. or to just enjoy at home. This won’t be the last time these wonderful little bars appear at my house! Preheat oven to 350 degrees F. Grease an 8″x8″ glass baking pan; set aside. In a large bowl, cream together the butter and brown sugar until light and fluffy. Whisk together the flour, baking powder, salt, and oats in a smaller bowl. Stir the dry ingredients into the butter/sugar mixture until combined. Press a little more than half of the dough into the bottom of the prepared pan and bake for 15 minutes. While the bottom layer is baking, stir together the sweetened condensed milk, lemon zest, and lemon juice in a small bowl until smooth. 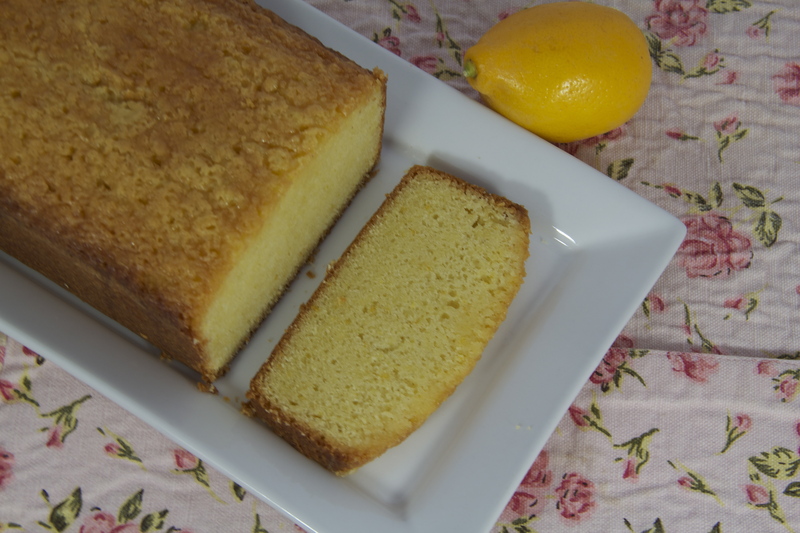 When the crust is finished baking, pour the lemon creme over the hot crust, smoothing the top with a spatula. Crumble the remaining cookie dough over the lemon creme and bake for an additional 25 minutes, or until crust is light golden. Let the bars cool completely before slicing into squares. Store in an airtight container in the refrigerator.